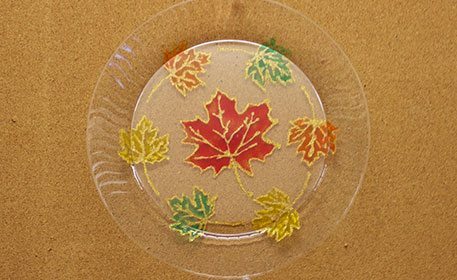 Create a faux stained glass plate perfect for the fall season, using gold glitter glue and suncatcher paint pens! Grab the free leave printables to get started! Download, print and cut out the provided leaf template. To download the provided template, simply click the “Template” button above. You do not need to cut the leaves out exactly, but just so they can be situated on the plate and you are able to trace the lines. Tape the templates to the top side of the plate. We decided we wanted to repeat the smaller leaf around the edges, so we kept moving the template as we went around. Once the glitter glue is dry, fill in your leaves with suncatcher paint pens.